Woohoo – it’s Christmas week! Get ready for a special week – daily posts about all things Christmas! I thought I’d start off with a tasty holiday cake that is much easier to make than it looks – eggnog bundt cake! I tried out this recipe a couple weeks ago for my mom’s birthday. She loves eggnog, so I thought of her the second I saw this cake. Bundt cakes are pretty easy, especially if you don’t have a lot of time for prep or decorating a dessert. You just mix everything together, pour it into a pan, and let it bake. Plus, the pan’s shape makes the cake pretty on its own. The only thing left for you to do is make the glaze and pour it on top! I was really pleased with the way the cake turned out. It was very eggnogy and super moist. My only complaint would be that it didn’t rise as much as I thought it would. Many bundt cakes bake up the pan right to the top, but this cake stopped short. Weird, since I used 4 teaspoons of baking powder in the batter. Still, I’d make this cake again. Maybe for Christmas? I’m still settling on which desserts to make for the two Christmases we attend, and this cake is definitely on the short list. I’m always on the look out for a quick, easy dinner. The less prep/hands on time, the better. Last weekend, we had a gorgeous Sunday with highs in the 60s. In November. No one felt like cooking. I knew we had some udon noodles in the pantry, so I thought making some sort of Asian dish would be easy. We always have frozen chicken around, and I thought we had some peanut butter in the pantry. Peanut chicken it was! I found this recipe online, and made a couple changes. I substituted plain yogurt for coconut milk and white balsamic vinegar for red wine vinegar. The recipe didn’t say if the chicken should be thawed or if it would work with frozen chicken, so I just added the chicken while it was still frozen and put the sauce on top. I cooked on high for 4 hours, shredded the chicken, and added it back to the pot while I cooked the noodles as the package directed (with a bit of sesame oil). We didn’t have any cilantro, so we topped the dish with green onion instead. The total time on this couldn’t have been more than 20 minutes or so, not counting all the time in the crockpot. And it was delicious. There are two things that make me really like this dish. First of all, every ingredient in the recipe is a staple I have on hand (minus the noodles). That’s the second thing – the peanut chicken can be served with a ton of options like rice, any kind of noodle (even spaghetti in a pinch), or even as the filling for lettuce wraps because of its thickness. Given the ease of the dish, I know we’ll be making this recipe often. We definitely found a new meal to add into the rotation. Over the weekend, I attended a lovely bonfire gathering at a friend’s home. It was so much fun getting a chance to catch up with our group from college group – something we don’t get to do all that often. There was so much food, lots of fall beer, and even spiked apple cider to enjoy all evening. I volunteered to bring a dessert, and knew s’mores were already on the menu. I wanted to make something a little different, and decided to try my hand at baking apple cider donut holes. I was so glad that they turned out to be a hit! I found this recipe, and used it as my starting point, but I made some changes. First, I didn’t have cloves on hand, so I reduced the apple cider with some mulling spices, mainly a bit of allspice. Next time, I plan to use more mulling mix. I think it will give the donut holes a deeper, autumn-y flavor. 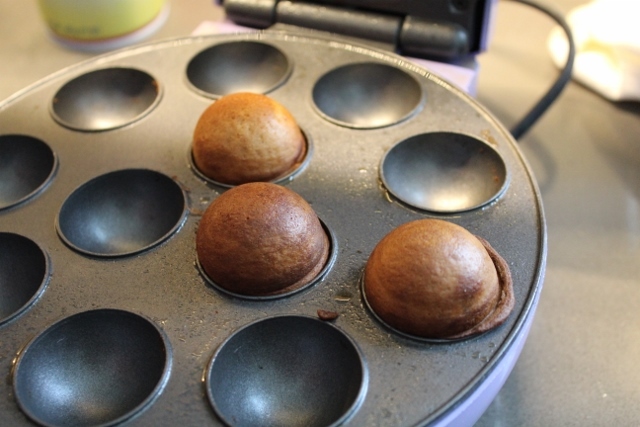 I also used a babycakes cake pop maker (to get that perfect spherical shape) instead of a mini cupcake pan or a mini donut pan. I sprayed the maker to keep the holes from sticking, which gave the outside a bit of a crisp to it, like a fried donut. The baking time in the cake pop maker is super quick – about two and a half minutes. You may need to pick off a bit of the extra dough batter that bakes outside the pan well, but it should easily come away from the donut hole. Finally, I think we goofed by using plain old apple cider. I thought it was weird that the bottle was labeled apple cider, but no cinnamon, cloves, allspice, etc. was added to what appeared to be apple juice. 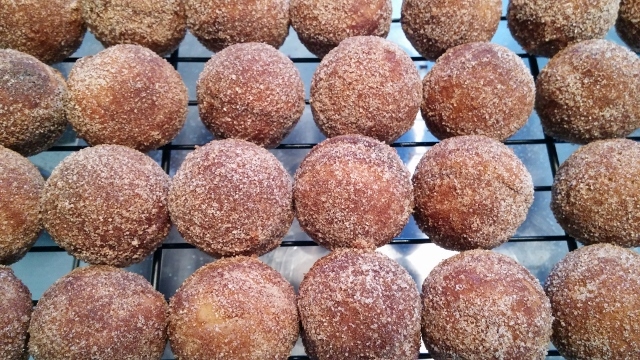 Next time, I’ll be sure to use fresh spiced apple cider, to have more of the spicy goodness in these little donut bites. The small size of the treats worked great at the bonfire. We passed them around the fire a few times, and by the end of the night, I think only about five or so remained. I’ll definitely be making these again and again this fall season. These nutter butter caramel apples look (and taste) so good, I’m just going to start with a photo. These apples weren’t very difficult to make either. I’d say from start to finish, it took less than 30 minutes. Start by washing and drying the apples. Melt down the caramel by putting all the candies and the 2 ounces of either milk or water in a pan. Heat slowly, stirring almost constantly so the caramel doesn’t scorch. Jam the stick you’re planning to use into each apple. Make sure it’s in tight so you don’t lost the apple in the caramel! Either pulverize the nutter butters in a food processor, or, for a bigger cookie pieces, chop them up with a knife. We opted for the latter. Spread the nutter butters out on a cutting board, and mix in some sprinkles, if you’re planning to include them. When the caramel is ready, grab an apple and dip it into the caramel. Make sure to swirl it around a bit to get all side covered. 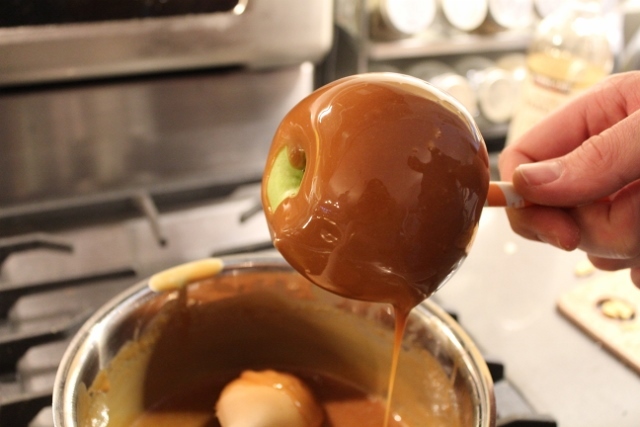 Continue swirling the apple as you take it out of the caramel, and let some of the excess drip off. 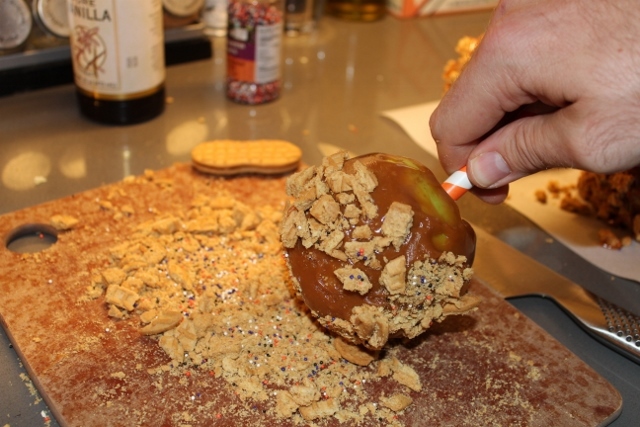 Once all the caramel stays put, quickly roll the apple into the nutter butter and sprinkles. 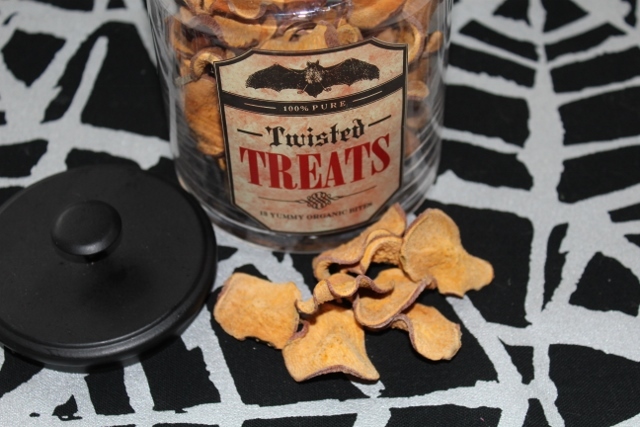 You will want to be sure to place the apple onto wax paper to fully set. Don’t use any other surface, or I’m pretty sure your apple will get stuck. Continue the process until you finish all 6 apples. Dan and I brought these as a dessert for a dinner party we were going to and they were a hit. I do want to note that we compared one of our caramel apples to an Affy Tapple the hosts had, and the apples we made were HUGE. 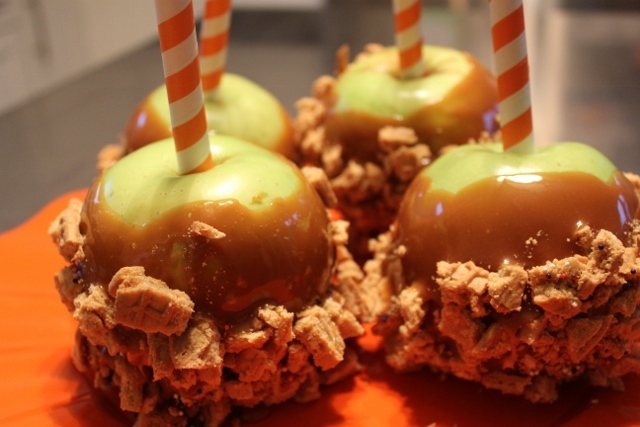 So, maybe split one of the caramel apples with a friend? Just kidding. Eat the whole thing and enjoy it!